The more varied businesses get in how they are constructed and run, the more management mistakes I see being made. This is only to be expected, of course, and to a degree, we're all re-learning how to run our businesses. For the first time in my memory, the remote worker is a viable option for many businesses. Time cards are going out of style, as is the concept of business hours. So what management mistakes are being made, and how can we avoid them? Here are some of my thoughts. The idea of corporate structure or (to use a term with which I'm more comfortable but which seems to be outdated) hierarchy seems to have started to make the modern workplace uncomfortable. This is especially true, I've noticed, for startups. I hear things like "everyone is equal here" and "We're a team." True. You are a team. Every company is a team, but even (and especially) the best teams have strong leadership. When it comes to project management, the idea of absolute democracy is dangerous. Sure, everyone should feel free to voice their concerns and ideas, but to do so in some egalitarian corporate utopia ensures that while everyone is heard, nothing gets done. You have a project manager for a reason. Manage the project. This might mean utilizing the role of project sponsor and creating a hierarchy from there, but it is important for the sake of your team to make sure there is some structure. Structure creates accountability, and accountability creates (hopefully) accomplishment. One of the great things about project management systems today is the degree to which I can micro-manage without being a "micro-manager." What I mean is that while it is typically my responsibility to manage a project from the 30,000-foot level, I can, thanks to modern project management systems, find out what any employee is or is not doing at any given time. What we need to be careful of, however, is getting so entrenched in perfecting the nitty-gritty of the project that we forget that, as I said before, you are part of a team. You're working with smart, capable people, many of whom are only in entry-level or mid-level positions because they are junior employees for the time being. You'd be surprised how much they could offer above and beyond getting the job done if they were aware of how their portion of the overall project impacted the final product. Before breaking the project up into bite-sized pieces, give everyone a look at the feast. They'll probably have ideas on how to make it even better. Project management systems are great, in part because they free me up to do so many other things. The days of me running from office to office or sitting on the phone waiting for boring status reports are over. Did John do his part? Let me check. The project management system I'm using tells me that he hasn't, that he had to leave early yesterday, but that he's spent three hours on it so far and will have it to me by the end of the day. I learn that at a glance and can move on. In my experience, however, project management systems allow me to be a little lazy, too, and of course, that's no good for business. I'm not a lazy person, but if I can be freed up to do something other than gathering status updates in some big meeting that takes half of the day, sign me up. In the previous example of John, however, I would have been a little lazy. What lazy thing did I do? I didn't ask John what happened yesterday that made him have to leave. I should know this. If John had a stomach ache and is feeling better, great. Carry on, John. But if his mother is ill in the hospital and he's not sure what his next few days will look like, maybe it's best to find someone to help John with his work. Not only is he probably (and understandably) a bit unfocused, but he may be rushing out of the office at a moment's notice. If I did not get away from my screen to ask John what was going on, I put myself in the position to be left in the lurch by someone with no control over their situation. This is something I see more than I'd like to, and I'm not sure I understand it entirely. One department will be running a project management system they like and with which they are entirely comfortable, while another will use an entirely different system. They'll do their best to work together, often having to input the same data twice to accommodate for the use of different systems, but at least they don't have to get used to yet another one. I get not wanting to get used to another project management system, especially when they are getting so robust and are tempting to executives who are usually trying to find ways to become more efficient and communicative. So I understand not wanting to do it. What I don't understand is not doing it at all. Dive in. Discover the problems early on so you can fail early (if at all) and move on. Anything else just creates more opportunities for miscommunication. This isn't the result of project management systems per say, but I think they make it easier. Since I can sit in my office and determine deadlines with pinpoint accuracy, packing each employee's day to the minute with tasks, I can create deadlines without a doubt that they can be met. The problem is, since I didn't talk to anyone on my team about these deadlines, I didn't know that one client is particularly needy and will likely take a little more time than usual. I didn't know that this particular client has extremely strict legal guidelines that they must take into account before approving the work we're doing, so what typically takes us five hours could potentially take us seven. Leaving no room for error in your deadlines usually leads to over-promising and under-delivering to your clients. Check in regularly with your team before setting deadlines because you may be being over-aggressive without knowing it. 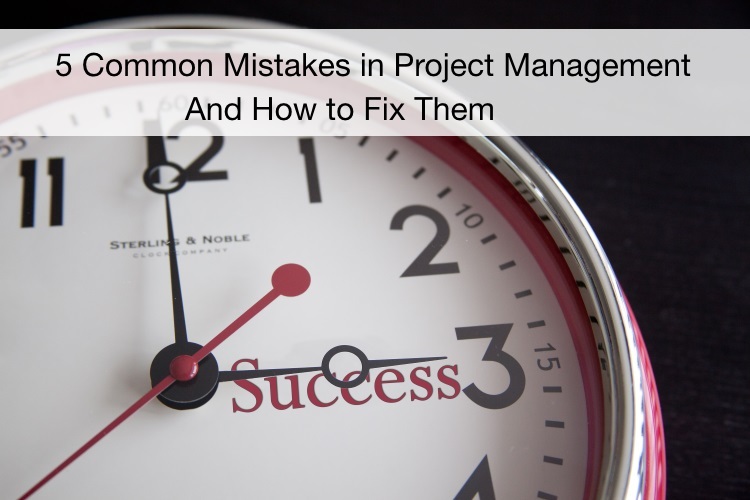 The Common Mistakes in Project Management and How to Fix Them - InLoox • Copyright 1999-2019 © InLoox, Inc. All rights reserved.